I love these cute little quiches because they have a unique and tasty Mexican twist to them, and we all know by now how much I love my Mexican food. Topped with some sour cream and juicy tomato and my palate was in heaven! If you are looking for a change to your typical quiche recipe, definitely give this a try! Too cute! I actually thought they were stuffed mini portobellos before I read muffin tin. Love the idea, Nikki! Tell us more about Snap when you have time! These look ahh-mazing! I love that they're vegetarian and mexican! The mozzarella and tomato topping looks so cute! Sounds wonderful, I will definitely be using this one very soon. One question I cannot find where to add the 1/2 cups grated Parmesan Cheese. Am assuming to add it with the cheddar, spinach and cottage cheese. Please confirm. thanks for sharing so many wonderful recipes. Yes you are correct. So sorry about that. Thanks for catching that. The recipe has now been updated. I am not sure, I haven't done it that way before. It will probably take less time, you will just have to watch them to they reach the point where the eggs are cooked through. Sorry I am not much more help on that. If I try it out, I will let you know. Eggs added in step 1 or step 2? Can't wait to try this! SO sorry about that. They are added in step 2. Thanks for catching that. You have 4 eggs in the ingredient list. Are they added in step 1 or 2? 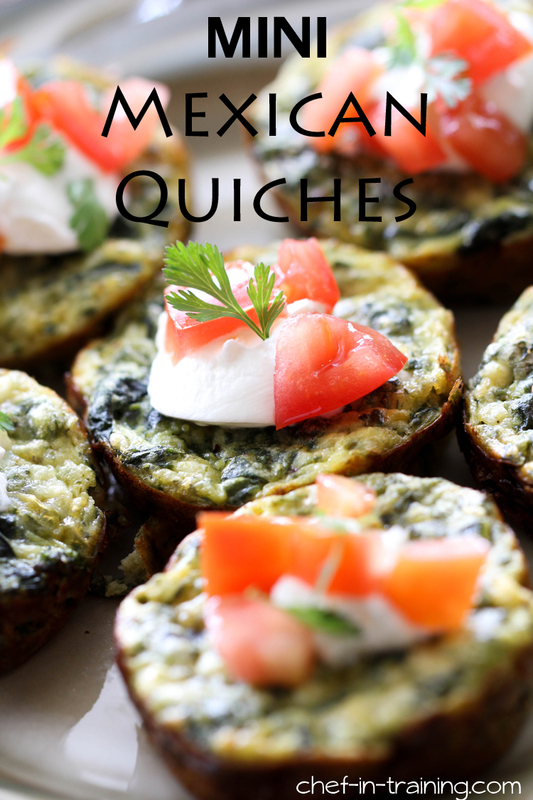 Wow, I definitely will try these mini Mexican quiches. I totally like making all kinds of quiche. They are soo good. Nice recipe - thank you. I’ve made this recipe many times and LOVE it! I just tried to come back to it though and don’t see the instructions anymore though! I’m not sure why. Only the picture. Can you please give me the instructions? Thank you! So sorry about that! It should be there now.